For thousands of years, the secret arts of magic have been passed down from master to student. It is a joy and an honor to be able to be part of this legacy. 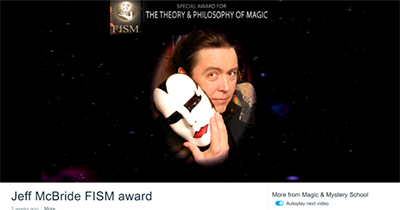 Las Vegas, July 16, 2018 – Las Vegas magician Jeff McBride was just awarded one of the magic world’s most prestigious awards, the International Fédération Internationale des Sociétés Magiques (FISM) Theory & Philosophy Award. The award was announced over the weekend of July 15 at the organization’s tri-annual convention, held this year in Busan, South Korea. FISM is an international body coordinating dozens of national and international clubs and federations around the world. 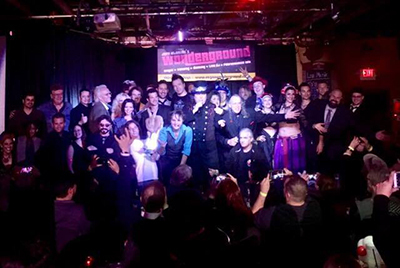 Together these clubs represent approximately 50,000 magicians from 50 countries as of 2015. The FISM Special Awards began in 2006. There are three categories. Each is intended to address more than a single accomplishment; to consider a person’s work covering a wide span of time. Over a hundred people from around the world are asked to propose names. A slate of five nominees in each category is determined, and the same group of over a hundred votes. Jeff McBride was in the category of Theory & Philosophy. This award gives tribute to a person who has approached magic from a viewpoint that is analytical, academic, perhaps even spiritual. And, as announced before an audience of 2500 in Busan, the winner this year was Jeff McBride. 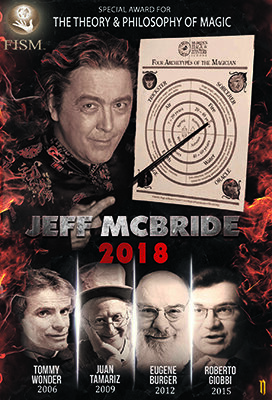 A 10-year headliner at his popular McBride’s Wonderground nightclub, in Las Vegas, McBride has long been known as a foremost innovator in the world of magic, being among the first to incorporate masks and pantomime with world-class sleight-of-hand skills. His early career saw him as the opening act for such superstars as Diana Ross & Grace Jones. Later, his full-evening shows won rave reviews off-Broadway, in Atlantic City and Las Vegas. He is the founder of the McBride Magic & Mystery School in Las Vegas, McBride’s Wonderground (magic nightclub) and can be seen regularly on such popular television shows as Masters of Illusion and Penn & Teller’s Fool Us. He is the author of the book The Show Doctor and host of the Monday Night Mystery School webcast, currently with over 350 episodes archived. For more information, or availablility by phone or SKYPE. Strolling magic at 7:30 anyone can join in the fun! Kim Zoller – The Sorceress! Jo de Rijck and Curry – Fooled Penn & Teller! Xavier Mortimer VS. El Diablo!